The graphic on the left shows stars near the Solar System. Use the slider to zoom in or out in that graphic. 1. 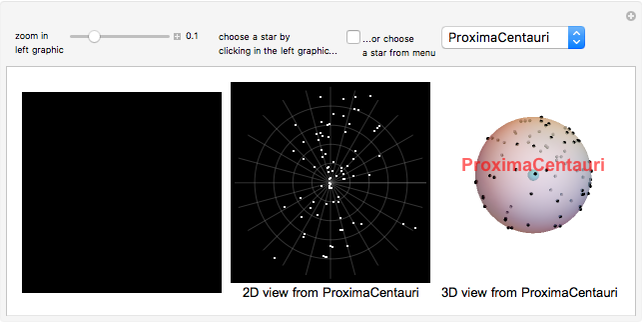 Select the checkbox and click in the left graphic to choose a star by its label. 2. Deselect the checkbox and select a star by its name from the pull-down menu. In either case, the second and third graphics show the neighborhood of the star in 2D and 3D. Cindy Luo "Neighborhoods of Nearby Stars"